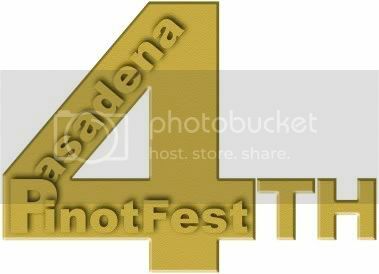 The new year brings a wealth of great opportunities to taste wine in Southern California, and one event Pinot Noir lovers always make it a point to attend is the Pasadena PinotFest. The 2012 edition is the 4th annual for the event which celebrates "Pinot Noir and all things that go with it." The Grand Public Tasting will show off the Pinot Noir of 100 different producers and the cuisine of some of the top restaurants in Pasadena. It's a gourmet delight. The wine promises to be superb, and the chance to talk with the winemakers about the Pinots they're pouring is not to be missed. Parking for the event is free, and so is the shuttle which will take you to the Altadena Country Club. Tickets are $89, $119 for VIP tickets. The Grand Public Tasting event will be held Saturday February 11, 2012 at 1:00 p.m. at the beautiful Altadena Country Club. There are several mini tastings slated in the weeks preceding the event at Noir Food & Wine Bar in Pasadena. These tastings will be held on the four Saturdays before the Grand Public Tasting, from 3:30 - 5:30 p.m. In addition, four winemaker dinners will be held at the Altadena Country Club, AKA Bistro, Bistro 45 and The Raymond. The Grand Kickoff Dinner is set for January 15th, so you'll have plenty of time to get yourself ready for the big tasting event. Check the Pasadena PinotFest schedule of events to make sure you can grab the ones you like best. The Pasadena PinotFest benefits Hathaway-Sycamores Child and Family Services, one of the largest, nonprofit, private children’s mental health and welfare agencies in Los Angeles County. They provide services to over 8,000 children and families annually in the greater Los Angeles area.